As a reward for investing, we’re looking into offering things like invites to the pool’s grand opening, priority access to events, and discounted entry. Is there anything else you would expect in return? Why would you like to invest in the pool? Did you use it in the past? What does it mean to you? You already know the story… Tynemouth Outdoor Pool, situated at the southern end of Longsands Beach, opened in 1925 and quickly became the go-to destination for locals and visitors alike. But with the introduction of cheap package holidays in the 1970s, its popularity began to wane and in 1996 it was unceremoniously turned into an artificial rockpool that ultimately became the crumbling eyesore it is today. As a result, those same locals and visitors have spent the last 20 years asking one big question: when are they going to do something about the pool? That’s why we’ll be launching an exciting Community Shares Offer early next year – so that everyone has the opportunity to dive in and play a huge part in the future of the pool. *UPDATE* We’ve now opened pre-registration for our Community Share Offer, so please register your interest by completing the form on this page today! Why invest in Community Shares? Since 2009, almost 100,000 people have invested over £100m to support 350 community businesses throughout the UK. We’re talking local shops and pubs, renewable energy schemes, community facilities, new football clubs, heritage buildings, and more. And every single one of those projects has helped to build a stronger, more vibrant, and more independent community. 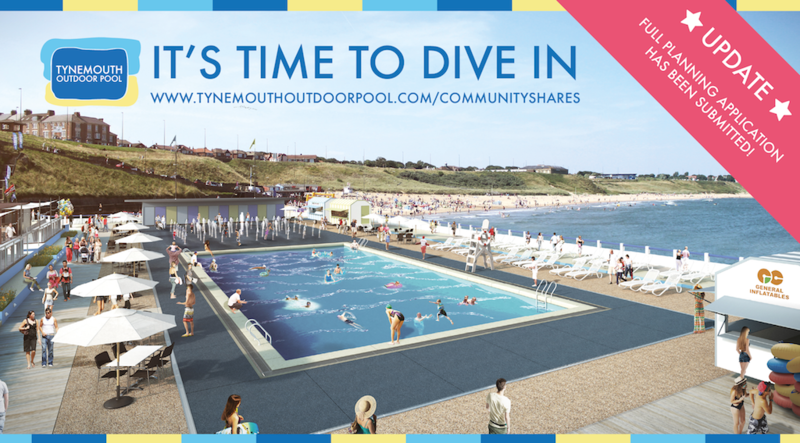 So whether you live in and around North Tyneside and the wider North East region, or you used to live here, or you have family or relatives living in the area, or you just like visiting the place, there are loads of reasons why you might want to invest in the future of Tynemouth Outdoor Pool. To complete Phase One, we need to raise around £2m in total. We’re hoping our Community Share Offer will raise around £500,000, and we think that’s more than achievable given that the national average raised from over 150 similar offers in the UK is £200k. You can read the long answer to this in our main FAQs on the site, but the short answer is that we’ve probably already raised in excess of £200k in donations, events, merchandise sales, and pro-bono work – every penny of which has gone towards progressing the project, and getting it to this stage. In fact, a ton of our time has been spent on looking at funding, including examining how other large regional projects are funded. We’ve tried Heritage Lottery twice (submitting back-breaking, time-consuming, multi-million pound applications each time), only to learn that the site doesn’t have enough ‘physical heritage’ to warrant a heritage grant. We’ve also done the same with Sport England, who unfortunately, place more emphasis on enclosed facilities, and again we were turned down. Finally, there’s the Coastal Communities Fund – which, we believe, fits our project like a glove. However, this particular pot of money is in high demand and the size of individual CCF awards has also recently been decreased so more projects can benefit. That means the huge £3-4 million pound awards don’t exist anymore, but there are still sizeable awards for well thought out and well progressed, coastal regeneration projects. Like ours. So, the Coastal Communities Fund will play a huge part in getting Phase One off the ground. There’s no guarantee, of course, but we’re in an incredibly strong position – and with a combination of Community Shares, Coastal Communities Fund and a bit of luck and determination, a brand new outdoor pool is almost with grasp! What’s the status of the project right now? This is the really exciting bit! The short answer is that we’ve now submitted a full planning application for Phase One of the build, plus an outline application for Phases Two and Three! If you want the longer version of that answer, the status is that we’ve applied for Planning Permission for an Outdoor Pool in a Conservation area, on a Blue Flag beach in a SSSI (Site of Special Scientific Interest). And that required an extensive and costly Environmental Impact Assessment, lab tests on the concrete, flood risk assessments, heating load analysis, traffic assessments, ecology studies, visual impact assessments, noise assessments, Heritage studies and that’s just scratching the surface. Not only does this continue to demonstrate how serious we are about the project, it also means that we’ll be ‘Project Ready’, which satisfies the criteria of major funding bodies, including the Coastal Communities Fund. This will also be the furthest that any attempt to redevelop the site has gone since the pool was closed in the 90’s. The Local Authority’s planning timetable means that should we hit a committee meeting in February next year for a decision on both the Phase One application and the full development outline planning application. This sets us up nicely for next summer’s round of CCF funding, and also brings a brand new sense of urgency to the project. And that means getting it BUILT! The money we raise via our Community Share Offer will play a huge part in doing just that. Who’s behind the pool project? Right now, the Friends’ committee includes members of the local community who generously donate their time and expertise, together with representatives from a range of organisations from North Tyneside Council through to Northumbrian Water. Since the project launched, we’ve also had the support of a nationally and internationally renowned team drawn from the architecture, building design, surveying, engineering, planning, photography and artwork sectors, and we estimated that over £100k of pro-bono design and planning work has already been generously donated to the project. The following FAQs should tell you everything you need to know about our Community Share Offer at this stage. But if you need more info, please check out the main FAQs on our site, or get in touch at info@tynemouthoutdoorpool.com. How much do you need to raise for Phase One? What will Phase One look like? There’s a huge clue in the picture at the top of this page! We’ve been hard at work preparing brand new visuals and drawings to support Phase One, and you’ll be able to see and read about these in detail on our website and in our shop on Tynemouth Front Street. Community Shares give the people who care most about a project (that’s you and us!) much more control over its future. Effectively, anyone who owns a share in the pool will own the pool itself, and will have a say in what happens to it. You can get the full lowdown on Community Shares here. We’re still dotting the i’s and crossing the t’s when it comes to the details, but we’re hoping that our offer will follow other similar community share offers in providing a Tax Break for anyone who invests. For example, you could get 30% of the value of your investment back as a a reduction in your tax bill. On top of that, anyone who invests could also enjoy a range of other benefits like a return on your investment and we’re exploring the possibility of invites to the pool’s grand opening, priority access to events, discounted entry once the pool is up and running, and more. Again, this is something we’re hoping will be possible. There would be some things to bear in mind though: for example, you’d need to keep your shares for a minimum of three years, and the pool would need to be profitable before we could return any investments. Will there be minimum and maximum levels of investment? The maximum that anyone can invest will depend on how we structure our organisation. We’re still finalising what the minimum amount will be – but we’ll make sure it’s appropriate for the majority of our community. Ok, I’m in! What do you need from me right now? Brilliant! Pre-registration is now open, so what we’d really like you to do is register your no-obligation interest in our Community Share Offer by completing the form on this page. It’s important to do this ASAP because this will give us the best possible chance of securing the funding we need to be able to complete Phase One. How can I get in touch if I have more questions? You can search for us on Facebook and Twitter.